But that hasn't helped women forced to rely on packed buses, by far the city's most-used form of public transportation - until this week. Some women, like Maria Elena Sanchez, have learned to take matters into their own hands. A 47-year-old office messenger who uses public transportation all day, said she carries a sewing pin for protection. "I always carry the pin so I can defend myself from abusive men," she said - adding that she's had to use it twice this month alone. 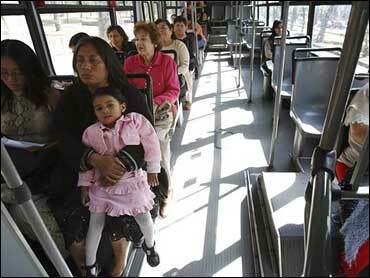 Traveling only with women, she said, makes her feel more secure and allows her to relax a bit on the way to work. "I don't think I will use the pin on these buses," she said, giggling.